Stonehenge is one of the world’s oldest mysteries. Why was this huge monument built? Was it a simply a burial mound? Was it built perform rituals and ceremonies, as the alter stone suggests? It is perfectly aligned to match the mid summer solstice, Why? Was it used as an observatory or part of an astronomy festival. And just as mysterious, how was it built? These riddles are still puzzling the world’s best scholars today. And, while the mystery remains thousands flock every year to visit this incredible wonder of the Neolithic and bronze age. Stonehenge is owned by the crown, but. the land around Stonehenge is owned by the National Trust. Management of Stonehenge is handled by the English Heritage. Millions of tourists every year visit Stonehenge. Stonehenge is without a doubt the most famous of Britain’s stone circles but it is by no means the only one. Over 1000 different stone circles are known to exist in Britain and other parts of Western Europe. Avebury, Arbor Low, Long Meg and her Daughters are among the more well known circles. Stonehenge was constructed during the Neolithic and bronze age. A henge is described as a monument made out of wooden pillars or stones that date back to ancient times. The pillars or stones may or may not be encircled by either a ditch or a bank. Construction of Stonehenge began more than 5000 years ago. Some scholars are now claiming that it may date as far back as 6500BC. Building on the Stonehenge continued for probably close to 1500 years. It has been estimated that more than 30 million work hours went into the construction of Stonehenge. The bodies that are buried beneath Stonehenge date back to more than 3000 years ago. Due to this some scholars are inclined to believe that Stonehenge was erected to be at least in a part burial area. The majority of stones circles do not have any signs of being used as a burial site. Stonehenge is located on the Salisbury Plain in Wilshire. Ii is about 137 km from London, England. The first part of construction involved building the ditch and the bank. It is believed that work on this part of the monument began in about 3100BC. Along the inside edge of this circle are 56 pits, each one about a meter in diameter. These holes have been named the Aubrey holes after the man who discovered them. One theory is that these holes may have been dug so that the people could use them to erect a timber enclosure, another theory suggests that these pits at one time had blue stones. Neither one of these theories has any physical evidence to back them up. The ditch is 320 feet in diameter. The second major phase of building saw the addition of the blue stones. This occurred about 2600BC. The blue stones weigh about 4 tons. It is believed that these stones came from the Preseli Hills which are about 250km away. Another theory which is gaining support is that the stones were actually much closer and were among the debris carried by the Irish Sea Glacier. The stones at Stonehenge were placed before the invention of the wheel. There are a number theories connected with how the stones were actually moved. One thought is that they moved the giant stones during the winter months when they could drag them across the snow. The Sarsen stones weigh about 25 tons and stand about 18 feet high. There are 30 Sarsen stones. The most common theory about the sarsen stones is that they came from a quarry near Marlborough Downs about 30 km from the site. The ditch surrounding the stone circle is believed to have been dug using crude shovels made from animal bones and the antlers from deer. There are 60 blues stones. The stones of the circle get larger as you approach the center. Close to the center are the trilithon structures. These structures are made up of two upright stones which support a third placed across the top. Stonehenge is perfectly aligned with major lunar and solar events. Among these event are the equinoxes and the summer solstice. 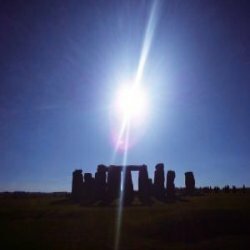 This entry was posted in Locations Trivia and tagged stonehenge, Stonehenge facts, Stonehenge history, Stonehenge history trivia, stonehenge information, Stonehenge trivia, Stonehenge trivia history by Jane. Bookmark the permalink.